One of our favorite small towns has one of the biggest July 4th festivals in the North Carolina mountains! The main street (Everett) in downtown Bryson City is closed for an old-fashioned, all-American celebration. 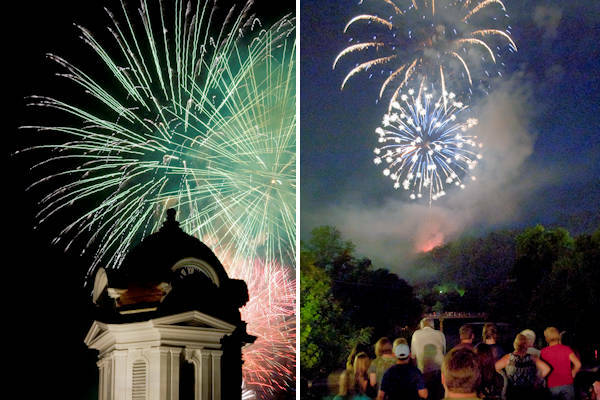 From an early morning race to the best fireworks in the Great Smoky Mountains, you'll find plenty to do all day. Admission is free. 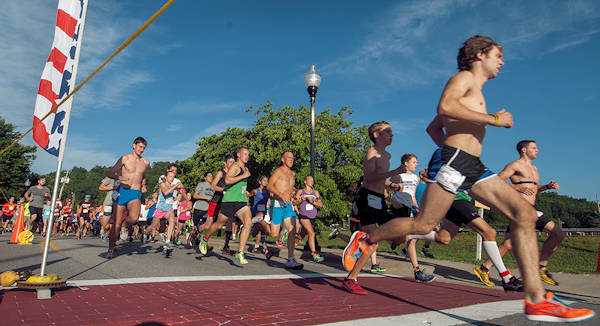 The festivities kick off at 8 AM for the Firecracker 5K with walk-up registration until 7:30 AM. The street festival begins at 10 AM with the favorite "Strut Your Mutt" pet contest at 10:30 AM. In addition to handmade arts and crafts vendors, enjoy live music at the Bridge Stage after 4 PM and plenty of festival food. Most of the downtown shops and restaurants will be open also. 2018 headliner will be Mountain Faith, a semifinalists on America’s Got Talent. For an entertainment schedule, go to the Bryson City Web site. 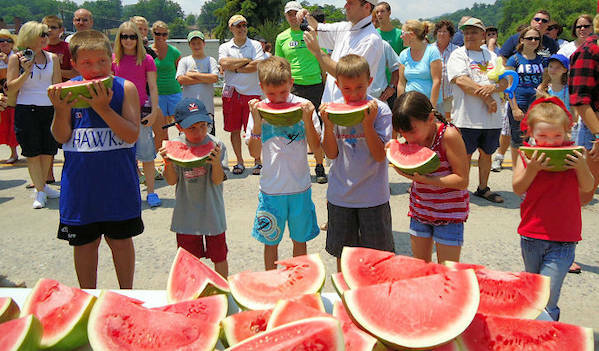 Find plenty of fun things for the kids at Riverfront Park - including the watermelon eating contest! 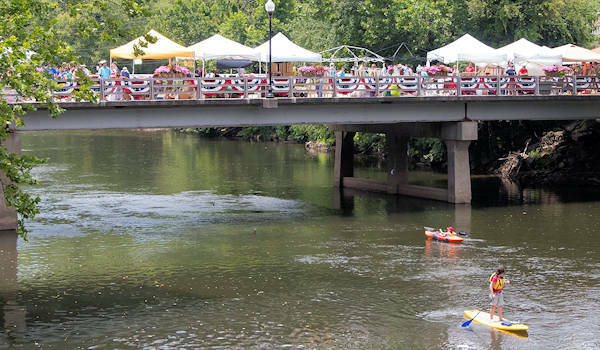 For a unique way to enjoy the festival, get a paddle board or kayak rental from Bryson City Outdoors and ride down the Tuckasegee River. Watch the fireworks from many great spots downtown, starting at 10 PM. If you stand on the bridge over the river, you can see the reflections too. 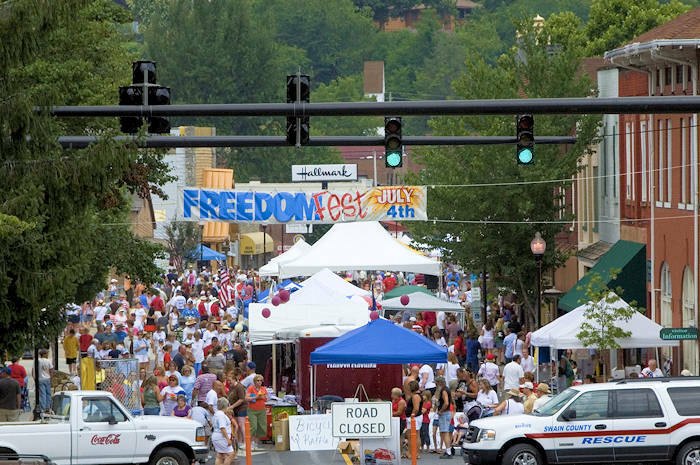 For more Freedom Fest info, go to the Bryson City Web site. The Great Smoky Mountains Railroad will have three trains on the 4th. It's a busy day, so buy tickets well in advance! 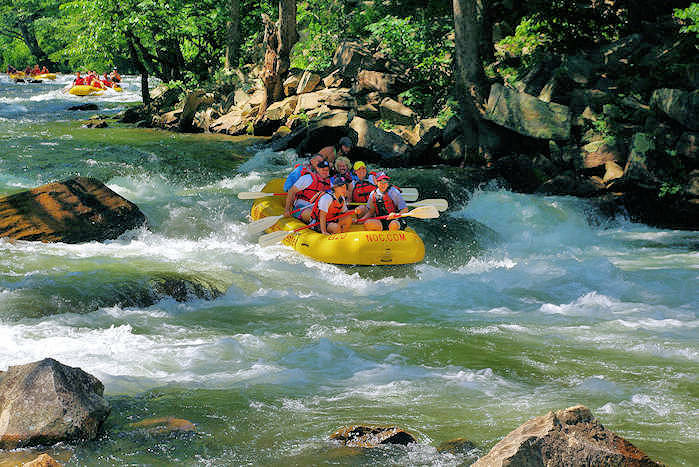 The 10:30 AM excursion goes to the Nantahala Gorge and the 1 PM trip follows the Tuckasegee River to Dillsboro. Their special 7 PM Freedom Train goes to Fontana Lake and returns to town in time for the fireworks. Dinner on the train includes BBQ and apple pie. Read more about the scenic train trips. 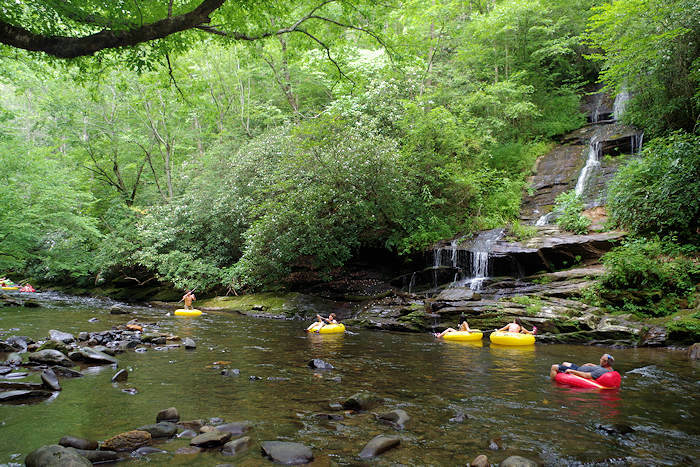 Tubing down Deep Creek in the Great Smokies. 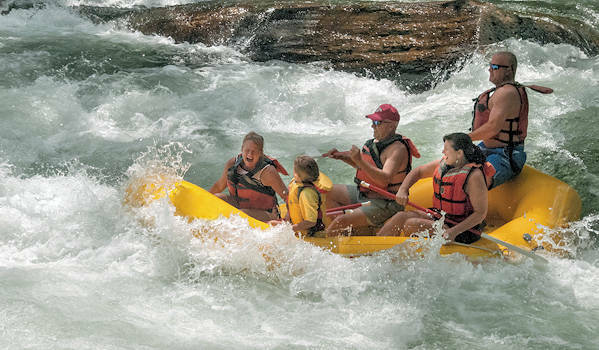 Whitewater rafting down the Nantahala River with top picks Wildwater Rafting & Nantahala Outdoor Center. Hiking in the Great Smoky Mountains National Park (see Road to Nowhere and Deep Creek Waterfall Hike). Keep cool atop Clingmans Dome (highest peak in the Smokies) - usually 15 degrees cooler than the valley, via the scenic Newfound Gap Road. See our Bryson City Guide for more things to do. Bryson City is about 65 miles from central Asheville - about a hour drive via the Great Smoky Mountains Expressway. Take I-40 West to exit 27 and follow US 74. Their Visitor Center is at 12 Everett St, inside the grand, historic Courthouse. Find many lots with parking nearby. Photos courtesy of the Bryson City / Swain County NC Chamber of Commerce.